Welcome to our FAQ page. We get hundreds of questions every week and we compiled the best ones here. We have divided them into categories based on history and services. Go ahead Choose a Button! What do I need in order to set up a website? The primary elements are a domain name (YourChosenName.com). HTML website pages are a fancy way to say your site can be uploaded; and web hosting which is basically a computer called a server that your html website sits on. Thus, when someone calls on your name, they will find the hosting computer which will send them your website information. Do I need SEO, Search Engine Optimization? Search Engine Optimization is not really an option to skip, unless you are purposely trying to keep your website hidden from public. There is both on and off page optimization that should be considered. This is necessary to help obtain organic (free) traffic and make it easier for your visitors to find you. The average amount of time is 2-6 weeks and depends upon the requirements of the site. Much depends upon how fast you get all your information to us. In extreme circumstances it can be done faster depending upon schedule. A domain name is your piece of Internet real estate. You will pay an annual fee under $20 per year. You can register for multiple years. This does help a bit with SEO. We will be happy to assist you in making a good choice by finding a good domain that matches your business services. Hosting will vary depending upon the package you choose. It can range from $10 to $60 per month. Our most common package is $20.00 a month, which includes minor maintenance to your website. We will help choose the best package to meet your needs. All websites that Badger State Web Service’s creates must live in our servers. However, if at any time you wish to move to a new web firm + web host, we will package up your site at no cost to send to the new firm. Though at that time, we will no longer be able to support your site. The company we use for web hosting is a data center called Rackspace. We are housed in the Chicago Data Center. On top of that Rackspace also has 24/7/365 security and monitoring team, so even when we are all sleeping, your server is being watched over with a Global Infrastructure and Uptime Guarantee. What if I already have my domain name and/or hosting? We are more proficient at working with name and hosting which we provide, since that is a service we offer. We know our servers, and we can have more management control in a faster time frame. Also we know what security and Application versions we are working with. With this said we can transfer your site to our servers. It depends. Your website project will be more affordable if you provide permission ready text and images that we can use to build your site. We do offer photography as well as writing and editing services for a fee. We can give you tips on the easiest way to submit your information for use on your website. Yes. We will help you source stock photos from sites such as www.crestock.com and www.istockphoto.com. We also have photographers and videographers available to produce custom photography and videos for your website. Website Maintenance is when you need to do some updates, additions or subtractions to your site. This could include biographies, personnel change, address change or maybe even menu changes. We can offer some content management systems that are free to use after your site is built, if we know about it ahead of time. Other options include software purchase which will give you total site control. Most customers want this in the beginning then to realize after 6 months they would rather have us take care of the changes for them. It can be a learning experience and with constant changes in the web industry it may not be the same editing UI every time you log into your site. If you have maintenance that needs to be taking care of please request it through our Customer Support Portal. Typically we require 50% down to get going. Most people prefer to pay with a check to start then we would bill you from our online billing platform at badgerstate.freshbooks.com. Some products and service can be billed and charged monthly automatically via the online billing portal. Please request this right from the get go or invoicing will be charged Annually by default. We also can receive payments through most major credit cards through our online billing portal. Yes and at no cost! You 100% own everything that Badger State Web Services creates for you and if requested we will provide a one-time full backup of your website. If additional backups are needed there is a minimal cost of generally $60 for 60 minutes of labor. Yes! 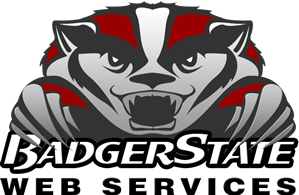 Top-notch customer support is key for a quality experience at Badger State Web Services, so we’ll do our very best to resolve any issues you encounter via our support page. Search Engine Marketing (SEM) involves a overall procedure of marketing a web site on search engines. This involves submission, optimization, paid inclusion programs and more. These terms doing well with search engines is not only about submitting right, optimizing in a good way or getting a good rank for a specific keyword. It’s about the complete job of improving how your site interacts with search engines, so that the audience you seek can find you. Search engine optimization (SEO) is refer to designing, writing, and coding (in HTML) of your web site so that there is a good chance that your web pages rank well of search engine queries for particular terms, especially with crawler-based search engines. How long does it take to get my website “indexed” on the search engines? It varies with every search engine. In general, most search engines will index NEW websites within a week. We will provide our best efforts without any seo guarantee to obtain high rankings for your selected website(s) with the major search engines and directories. With the growth in the number of websites, getting high search engine rankings with single keywords is very difficult. You are much better off targeting keyword phrases. Keyword phrases are two or three word phrases that your target market is likely to use to search for your site. “Home Business” is better than “Business” and “Home Business Software” is better still. Remember that single keywords usually return the least targeted leads. Yahoo and Google use two different algos to come up with their SERPs – Yahoo favors on- page optimization such as H1 tags, keyword density, etc while Google favors off page like inbound links. If you have done more on page then Yahoo will rank higher and vice versa. As part of this if you are now addressing your off page then you need more backlinks and time for these links to age. Would you be happier to achieve a page 1 listing out for 100,000 results or 100,000,000 results? The number of pages competing for a keyword has absolutely nothing to do with how competitive it is to get a site ranked for that particular keyword. The level of competition has everything to do with it. A site can be blacklisted if unethical search engine positioning tactics have been used or if the search engine algorithm determines that it believes they have been. It can be very difficult to recover from a blacklisting, often it is easier to simply use another domain with a new site and move forward from there after cleaning out whatever spam tactic got you banned. Not all spam is easily detected by the major search engines. Like hackers, every time a method gets detected a new method is created to bypass this. That said, it is usually a matter of time before the algorithm will be changed to detect new spam tactics and further, sites using spam can be reported and penalized individually. If you choose to use spam tactics to attain rankings there is a high likelihood that your site will eventually be penalized. Finally, what matters are the results, i.e. top rankings for keywords that are important to the prospects business plan. Link of the search engines as a big election. All the websites in the world are candidates. The links to your website are votes. The more votes (links) a candidate (website) has, the more important it is, and the higher its ranking. Link popularity is all about how many links you have, and how you can get more. Links to your site tell the search engines how important your site is. They assume that if it’s important enough for a lot of other sites to link to, it’s important enough for them to display at the top of the rankings. Links are the single most important factor in ranking. Generally speaking, the more links you have to your site from other sites, the better your ranking. The first thing you need to do when you begin chasing a good search engine ranking is decide which words you want to rank well for. This is called performing a keyword analysis. Keyword analysis involves a bit of research and a good knowledge of your business and the benefits you offer your customers. Directories are websites (or web pages) which simply list lots of website and give a quick description of the website. Some are free and some require you to pay for a listing. Free directories are useful because you get a free link. However, the links aren’t worth that much. Paid directories can be good if they’re relevant, but they can cost a lot in the long term, so choose wisely. How and what info that is submitted is very important. If if one thing extra is added or taken away from another directory you could be looked at as a duplicate listing and be docked for it. If this is important to you please look at purchasing our link building campaigns. Open Directory Project and Yahoo Directory are the good directories for any website. In plain English, copywriting means the writing of the words for your promotional pieces and other communications. This includes brochures, websites, letters, print ads, Google AdWords, articles, scripts, etc. Do you do Google AdWords or Yahoo Search Marketing? Yes. we can write your Google AdWords and Yahoo Search Marketing, even manage your entire pay per click campaign (including keyword analysis). Search engine marketing is not a one-time project. It must be seen as an ongoing strategic business process if you want to continually stay ahead of the competition. To that end, part of our consultative process is to assess the activities, strengths and weaknesses of your major competitors’ sites, and devising appropriate strategies for netting superior visibility for your site. No. Only in rare cases is a face-to-face meeting required. All correspondence can be over the phone, messenger, via email or through our contact us page.